(HOBART, Okla.) - Four Star Leadership with General Tommy Franks awarded $18,000 in scholarships to deserving high school students from around the world on July 13 on the campus of Oklahoma Christian University. The world-class leadership program celebrated the conclusion of its 10th anniversary with an awards banquet where students were honored for their achievements in writing, public speaking and an ethics bowl tournament. Four Star Leadership with General Tommy Franks is a partnership between the General Tommy Franks Leadership Institute and Museum and Oklahoma Christian University. During the world-class program, students learned leadership techniques from frontrunners in various fields. Politicians, dignitaries and star athletes offered their expertise to this year’s leadership program. Toward the conclusion of the week-long program, attendees expanded upon their skills through a persuasive speech and writing competition as well as collaboratively in an ethics bowl tournament. ​In addition to earning $18,000 in scholarships, attendees were also given the opportunity to garner internships and receive letters of recommendation. Program curriculum is designed around the four core principles that led retired Gen. Tommy Franks through his 38-year military career: character, common vision, communication and caring. The program is free for accepted students. For more information on the program or scholarship recipients, visit FourStarLeader.com. Four Star Leadership with General Tommy Franks is a partnership between the General Tommy Franks Leadership Institute and Museum and Oklahoma Christian University. During the world-class program, students will have an opportunity to learn leadership techniques from frontrunners in various fields. Politicians, dignitaries and star athletes are some of the national and international leaders who have offered their expertise to previous year’s leadership programs. Towards the conclusion of the week-long program, attendees will have the opportunity to expand upon their skills through a persuasive speech and writing competition as well as collaboratively in an Ethics Bowl tournament. Attendees will have the opportunity to earn more than $15,000 in scholarships as well as gain internships and receive letters of recommendation. Program curriculum is designed around the four core principles that lead retired Gen. Tommy Franks through his 38-year military career: character, common vision, communication and caring. The program is free for accepted students. For more information on the program or accepted applicants, visit FourStarLeader.com. 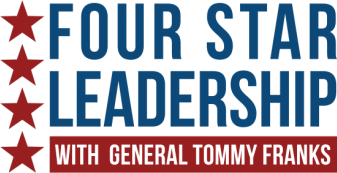 Four Star Leadership with General Tommy Franks is a world-class leadership program developed as a partnership between the General Tommy Franks Leadership Institute and Museum and Oklahoma Christian University. Four Star Leadership offers 70 top high school students invaluable leadership experience through an exciting and challenging curriculum at no cost to students. Since 2008, Four Star Leadership has welcomed 440 U.S. high school students from 44 different states and 43 international students. For more information on Four Star Leadership visit FourStarLeader.com or call (580) 726-5900.